We tried out a BLUE foundation primer – and it’s not just a gimmick | SHEmazing! Choosing the right base for your foundation is essential – primer is essentially that load bearing beam in a building that simply couldn't stand with confidence without it. Whether you have oily skin or dry, or want a primer that minimises pores, stops greasy patches or adds a glow, the beauty industry definitely has one for you – but have you ever considered using a blue primer? When we think of colour correcting, the main shades involved are green, purple, orange and yellow: blue has never been on the table. However, L'Oreal have recently launched a very intriguing new product in that exact hue. 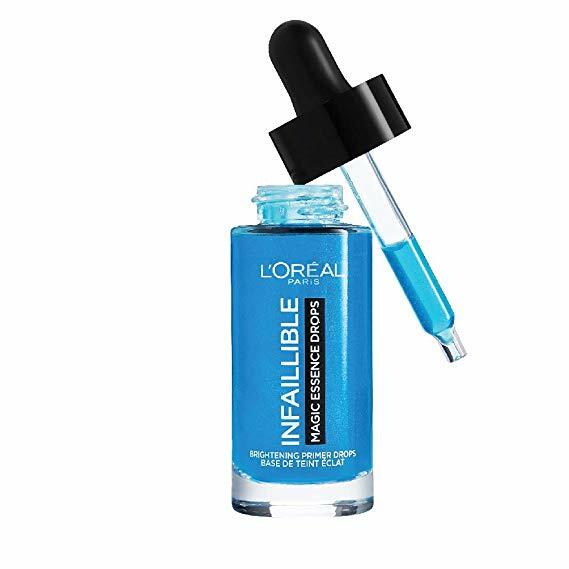 Coming in a makeup-table friendly glass bottle, the L'Oreal Paris Infallible Prepping Essence is instantly distinguishable thanks to it's electric blue hue. While you might automatically assume that the blue colour might just be a gimmick – or worse make you look washed out and grey – in fact the opposite is true. The blue oil essence counteracts sallowness to increase luminosity – and we can attest to that. Taking the blue drops for a test drive, a few drops of the liquid dripped onto the face is all you need, before buffing in with a densely packed makeup brush or just using your fingers. While the drops initially look blue on the skin, the drop's colour blends away to leave a moisturised, glowy base awaiting your foundation application. The instant effect is a youthful dewy shine that catches light on the high points of the face, and once foundation goes on top, it acts as a natural highlight – you simply look like you have a healthily dewy visage. However, unlike many primer oils, the blue Prepping Essence absorbs in an instant while leaving a glow behind. The essence is enriched with a cocktail of Acai, Kiwi & Goji plus Hyaluronic Acid, and deeply hydrates skin for up to 24 hours. We took it for a test drive – applying it both before a normal day of makeup wear and for a night out, and it definitely gets the seal of approval. For a daytime dewy look, we slathered it on in the morning with clean fingers, before applying a light layer of foundation on top, a slick of mascara, and a dusting of powder on the forehead and t-zone. No highlighter was necessary, as the primer alone gave us a 'lit-from-within' glow that was perfectly suitable for a day in the office. For night time, we first went in with a light cream moisturiser, before applying the Essence drops with a foundation brush – opting for one with densely packed bristles to create a buffing effect, really working the product into the skin. Then, we added a ;layer opf foundation and some cream contour. Our skin shone through the foundation, needing only a light but targeted application of powder highlighter on the cupids bow of the lips, the brow bone and the very highest point of the cheekbones to amp up that glow. 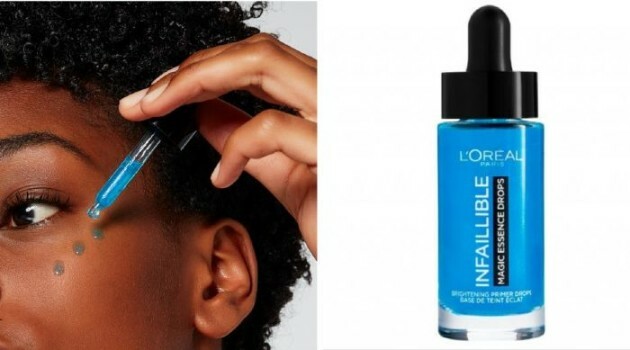 Unusually for an oil-like product, our makeup didn't budge while wearing it – we'll be keeping this blue trick up our sleeve for future makeup manifestations.